Jen is originally from Missoula, MT where she grew up and then went to the University of Montana. She majored in mathematics and Spanish and started her love for cycling with the triathlon club. Once she graduated in 2009 she qualified for her professional triathlon license and raced primarily half and iron distance until 2015. She moved to Bend, OR in 2013 and got hooked on bikes - mountain, road, and everything in between. She made the switch from triathlon to cycling in May 2015, upgrading from cat 3 to cat 1 that season. Now she’s had 2 successful professional cycling season and 2019 will be her third. Off the bike Jen works as a cycling and triathlon coach with The Endurance Collaborative and as an administrative assistant for Rebound Physical Therapy. Her favorite athletes to work with are juniors and women who are interested in using power metrics to improve their cycling. She started her love of coaching by coaching a swim team, all ages, for 6 years. 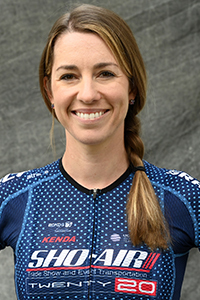 At Rebound, Jen works with a world-renowned biomechanist who does bike fits and running analyses. When she’s not racing on the road she loves nordic skiing, sailing and off-road bike adventures. I switched over to bike racing from racing triathlon professionally. I was part inspired by a nagging running injury and part inspired by the team aspect of racing. I love it when it truly is a team effort to win a bike race; it’s the best feeling ever whether you’re the one that won or a piece of the puzzle of the win. My “on the bike” inspiration is my team. I am constantly amazed and inspired by how hard my teammates work and the sacrifices they make. I use this in races and even in training when things get hard. I can always dig deeper when I imagine all that my teammates do. My “off the bike” inspirations are my parents. They work so hard, love everything they do, and take care of all of those around them. I strive to be as great of people as they are. When I’m training hard there’s nothing better than finishing off a big day with a cheeseburger with fries and a salad. I love all of the places that I get to see as a bike racer. We visit some places that I probably wouldn’t choose to vacation but end up loving because of a bike race. What’s better is we get to explore those places on 2 wheels which I always feel like is the best way to get to know a new place. My biggest accomplishment on the bike is my quick transformation from Ironman triathlete to a pro roadie. My first season on the road was a huge learning curve but I went from cat 3 to cat 1. By the end of my second season I landed my first pro contract and had the opportunity to race internationally for the first time. In my second pro year I finally started finding the podium. I attribute the quick transformation to a few things but notably, committing 100% to my goals and scoping out the process of getting there carefully with my coach. The Ardeche region of France is my favorite place I’ve ever raced. It was my first trip to Europe, I loved the European roads and style of racing, and the routes we were on were gorgeous and remote. We even had a stage where we finished on top of Mont Ventoux! I love skate skiing in my off-season and as cross training in the early parts of the race season. It’s great altitude training since it’s all above 6000 feet. It’s great for my balance and glute strength at a time where I’m usually spending quite a bit of time in the gym. Lastly, it’s a great way for me to spend time outside at a time of year where I might be relegated to the trainer. I always tell new bike racers to spend as much time as they can riding with other people and getting really comfortable riding in groups. It will make racing easier if you are more efficient at drafting and you’ll be a safer rider because of it. I firmly believe one of the biggest keys to my success is my consistency over YEARS. I was not instantly fast at riding bikes but I’ve been logging consistent miles on the bike for 14 years. Something that I do every day that is super important to this consistency is a daily check-in to my body and mind health. There are certainly niggles that you can train through but I have a really good grasp on what I can train through and when I should pump the brakes. Same with mind health; if I find myself really lacking motivation I am not afraid to take the time I need to refill the motivation tank. If I take the time when things pop up immediately it prevents me from having to take a lot more time off down the road. If I weren’t racing bikes I would probably be a math teacher at a community college. If I could spend 10 days anywhere I would be credit card bike touring through New Zealand with my boyfriend. I have 4 chickens, one of which does not have a right eye, and her name is Lisa “Left Eye” Lopez. I might still hold the 50 fly record for the Missoula Aquatic Club, to be confirmed. My closet is organized by sleeve length and the colors of the rainbow.